Thefooting is a senior software engineer who loves developing games. Currently, he is working as a C++ Senior Developer in Underdog-Games which he co-owns with the fellow livestreamer brodie124. In the past, he worked as a digital marketing expert in DHatch. His love for developing games has motivated him to stream on LiveEdu.tv and share his knowledge with the audience. 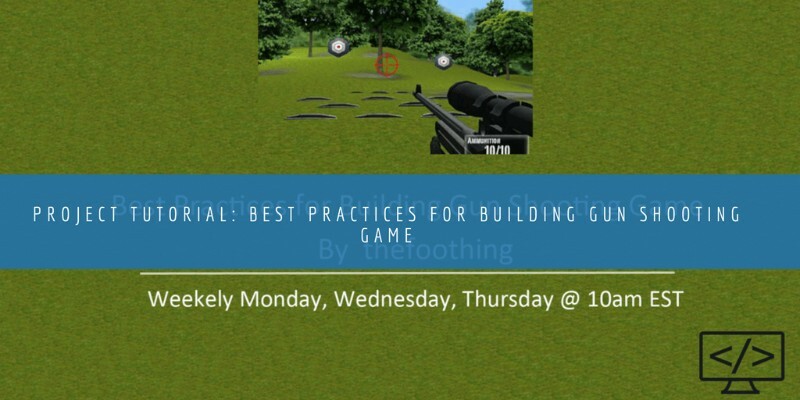 The project that he will work on is “Best Practices for Building Gun Shooting Game.” This project is in TEACHING mode. It is a live and real-world project. This means that you can interact with the streamer and communicate with them directly using chat. Got stuck? Just go ahead and ask him questions. Game development can sometimes be a challenging trade. It requires knowledge of different spheres including mathematics, design, philosophy and writing. The tutorial is aimed to teach best practices required to develop an elegant and functional shooting based game. Key topics such as client prediction and character movement will be taught in the class. Later on, the streamer will teach advanced subjects such as ragdoll physics and mesh culling. He will also use Orge3D to showcase a lot of mathematical based principles. The project is aimed at learners who want to improve their game development skills. Anyone who is also interested in shooter games and wants to know how different game elements work together in a shooter game will make the most out of the tutorial. To completely enjoy and learn at the same time, the viewer should have a basic understanding of C++, Java, and high-school mathematical knowledge. If you are a complete beginner, the course is not for you. You need to meet the basic requirement before you can start with the tutorial. Note: A desire to learn is the most important. If you are willing to learn something new, you are good to go. What will you be able to do after you finish the course? After you complete the tutorial, you will be able to build shooting games. This is extremely useful for budding game developers who want to dive deep into game development. You can take the skills learned from the course and use it build something new and unique. If you are interested in making a shooter game and learn the intricacies that go into making a shooter game, the course is for you. With the knowledge gained from the course, you can become a better GameDev and improve your overall skills. To watch and learn, you need a LiveEdu Pro subscription. With just the subscription, you will not only be able to learn from this tutorial but also get access to other Premium Project Tutorials.